The future of one of the borough’s most famous artworks, the Dalston Peace Mural, is under threat according to campaigners. The image stands on the side of a four story property that Hackney Council has voted to lease to a private developer. That move is now being questioned over the apparent lack of public consultation and concern that the longstanding and culturally significant mural is now the responsibility of a private building firm – Dalston Lane Property LLP. Earlier this month, the OPEN Dalston website (OPEN standing for Organisation for Promotion of Environmental Needs) reported on the council’s proposals and the developer’s plans to build a restaurant and bar in the area incorporating the Peace Mural building. However, Cllr Karen Alcock, Hackney Council Cabinet Member for Property and Housing Policy, said in a statement that Hackney Council is committed to protecting the mural. 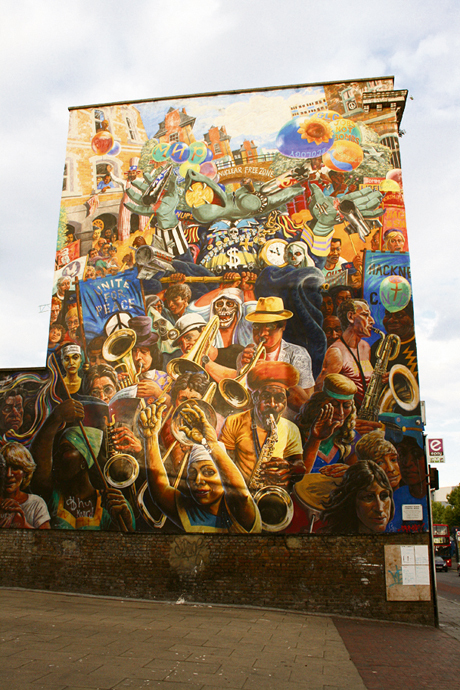 The Dalston Peace Mural, standing opposite Dalston’s Overground entrance and familiar to anyone living in the area, is based on Hackney’s 1983 Peace Carnival. It was designed by the socially conscious artist Ray Walker but, owing to his early death in 1984 (aged 39), it was completed by his friend, Mike Jones, and wife, Ann Walker, in 1985.